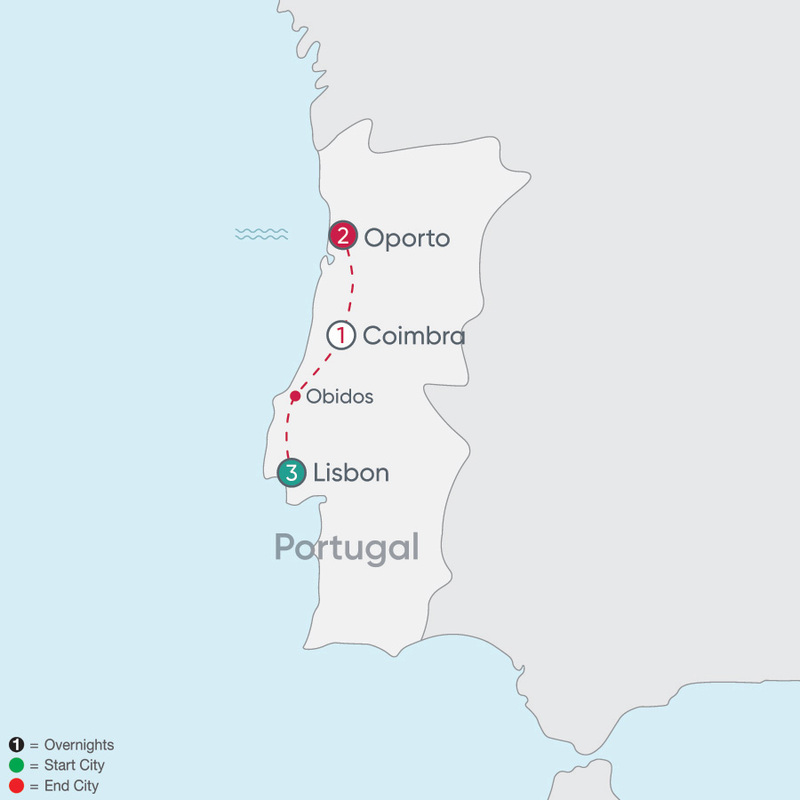 From Spain’s relaxing resort of Costa del Sol to Lisbon's Belem Tower, Cosmos offers you affordable tours throughout Spain and Portugal. 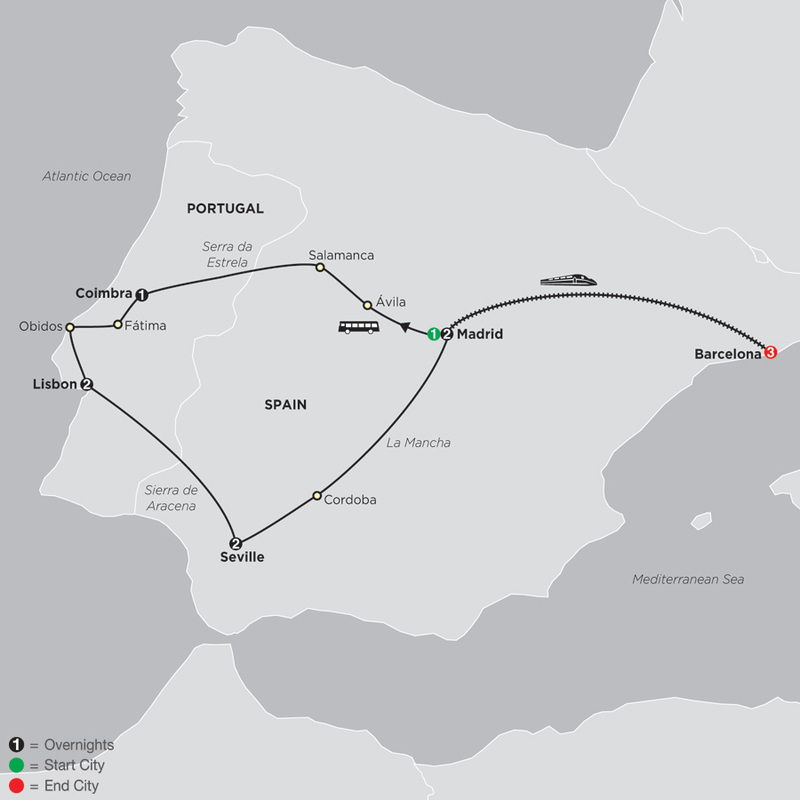 On your escorted tour, you'll visit Portugal's Sanctuary of Fatima and travel through Spain’s La Mancha. 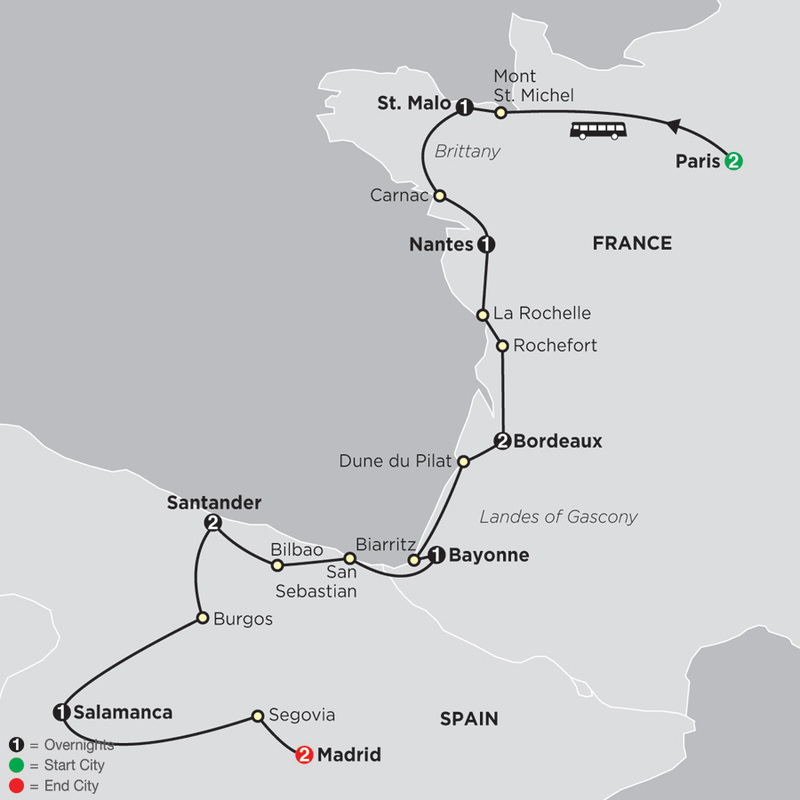 Explore Portugal & Spain tour packages below. From the capital city of Madrid to charming towns in the Castile & Leon region, you’ll discover stunning Spanish culture and history, from its plazas to the countryside. Sample local wine, jamon, and tapas—with direction from your Tour Director and CosmosGO app! Your escorted ...Read More. 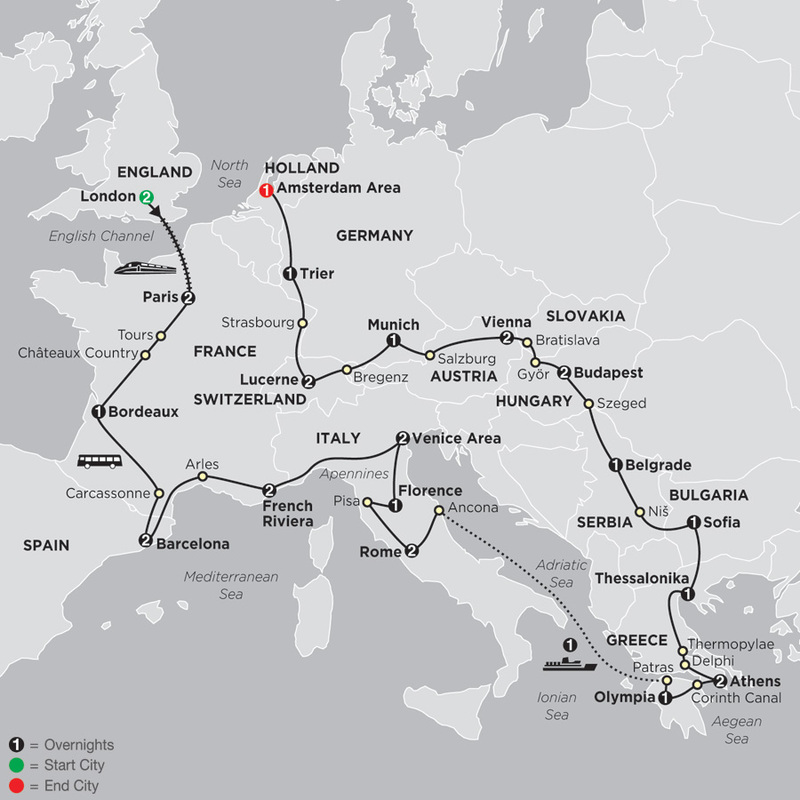 Join us for à la carte touring on your escorted vacation in Portugal—home to many of history’s great explorers. With so much to see and do in this beautiful country, it’s hard to imagine why anyone would leave to discover the world! From the international flair of Lisbon, to the ...Read More. 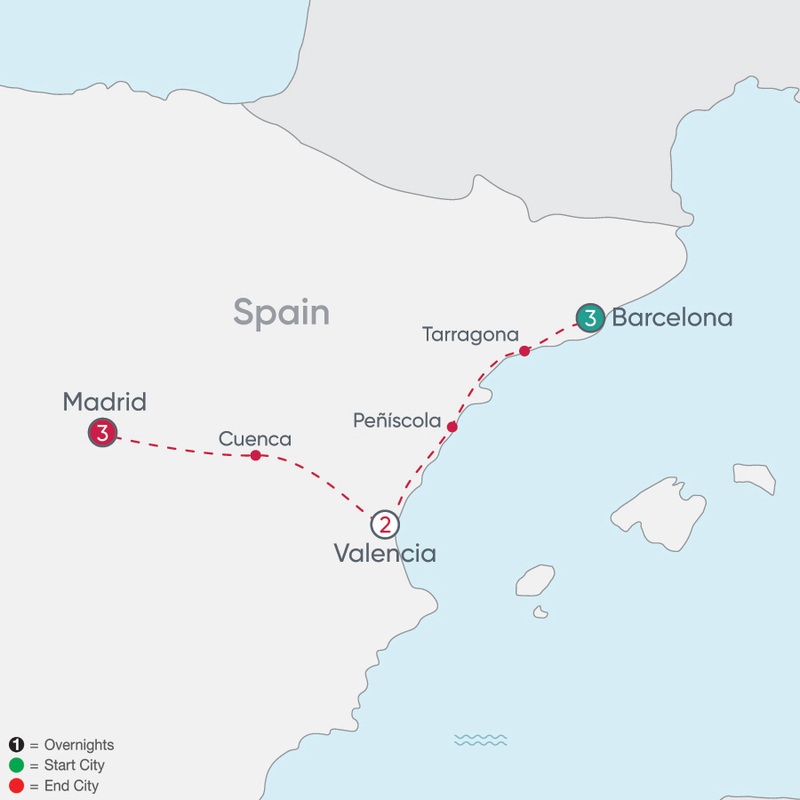 Barcelona, Valencia, and Madrid are spectacular Spanish cities: Barcelona, home of great artists Gaudi, Picasso, and Miro; Valencia with its contemporary architecture matched only by its fantastic food, fun, and beach life; and Madrid, the elegant city of sophistication and ...Read More. 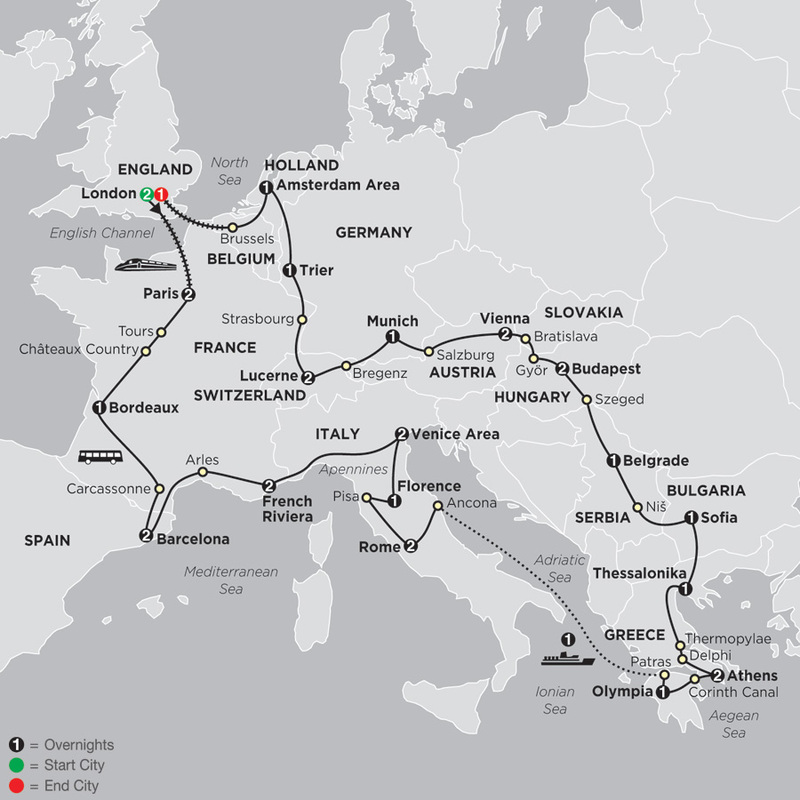 Your exciting Iberian adventure introduces you to fascinating cities and cultural discoveries on your affordable tour of Spain and Portugal. 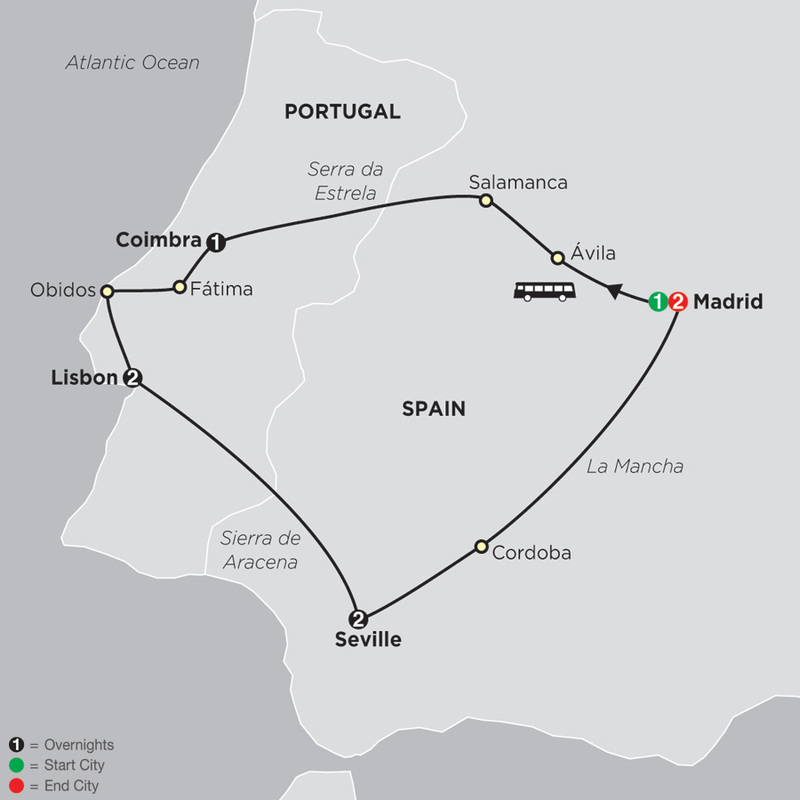 You'll stay three nights in Madrid, two nights in both Seville and Lisbon, and one night in Coimbra. Enjoy sightseeing with a Local ...Read More. Your 8-day affordable escorted tour of Andalusia begins in sun-kissed Mijas, where you’ll begin by exploring the village and resort towns on the coast. You’ll also visit the beautiful port city of Málaga – the birthplace of Pablo Picasso. Your guided tour of Andalusia offers an ...Read More. Spain and Portugal—these are two countries with rich histories and distinct cultures, and on this affordable Best of Spain & Portugal tour, you'll see their fascinating highlights. 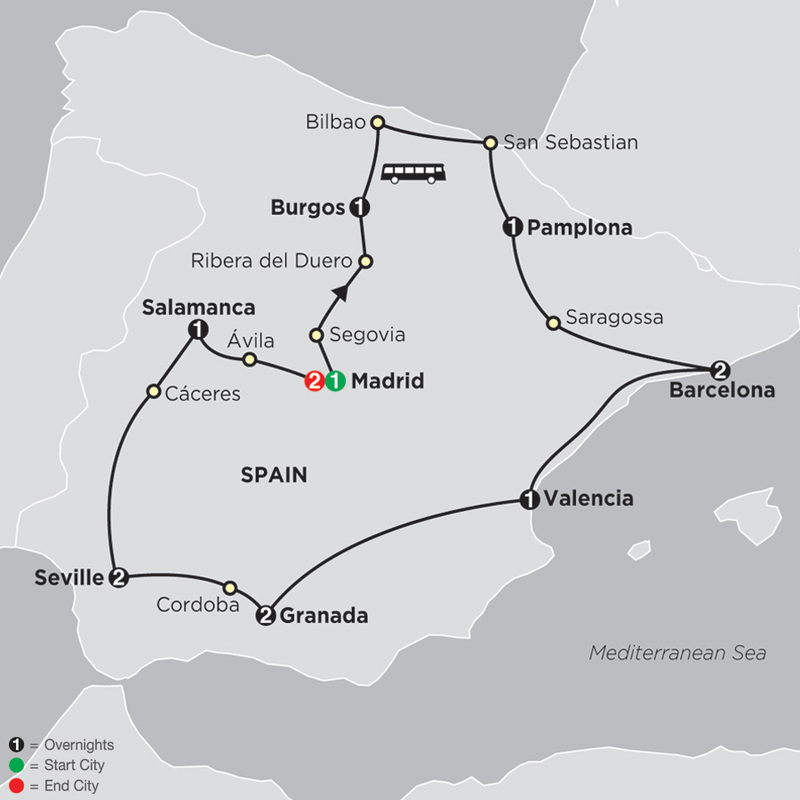 In Spain, you’ll overnight in Madrid, Granada, Cordoba, Seville, and Salamanca. In Portugal, ...Read More. 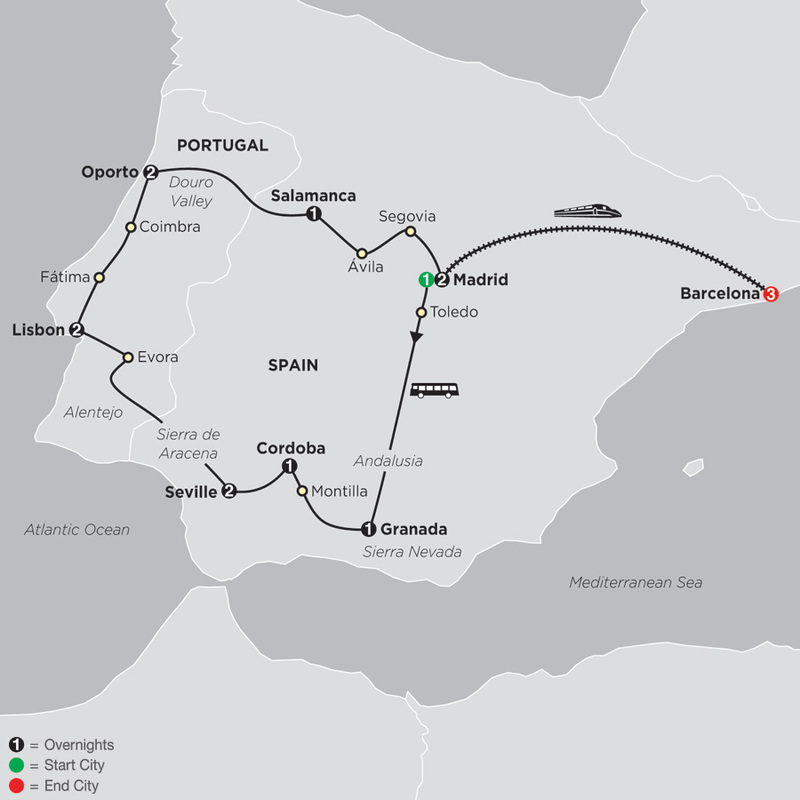 Your 14-day affordable tour of Spain begins and ends in marvelous Madrid. 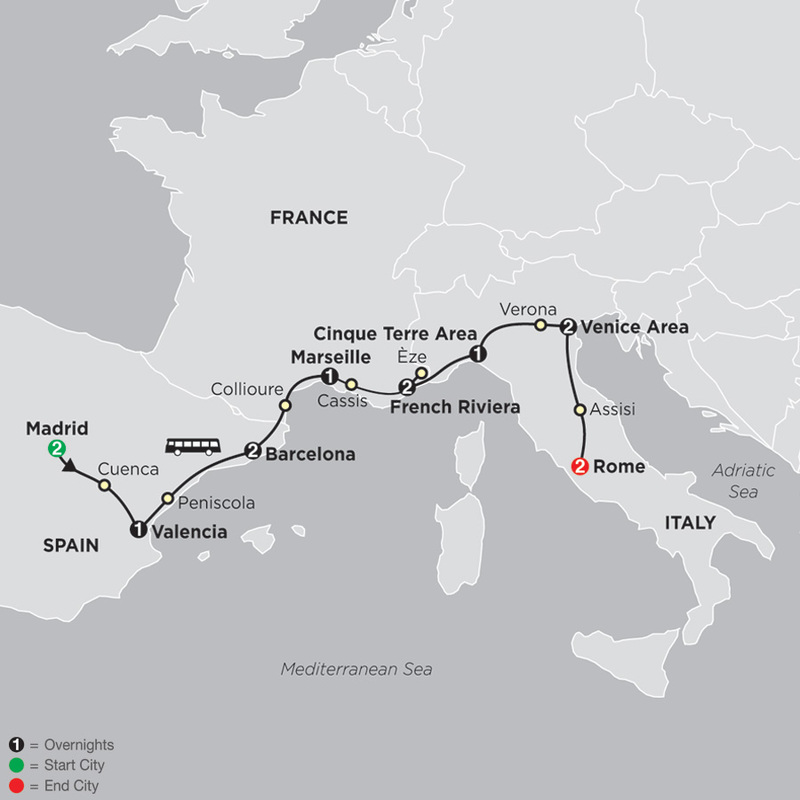 In between, you’ll discover Spain’s sensational sites and legendary locales of history, culture, and cuisine. You’ll visit the Basque Country in the cities of Bilbao, San Sebastian, and on to Pamplona—city ...Read More. On this Spain, Portugal, and Morocco tour, experience these three glorious countries with rich histories and distinct cultures. 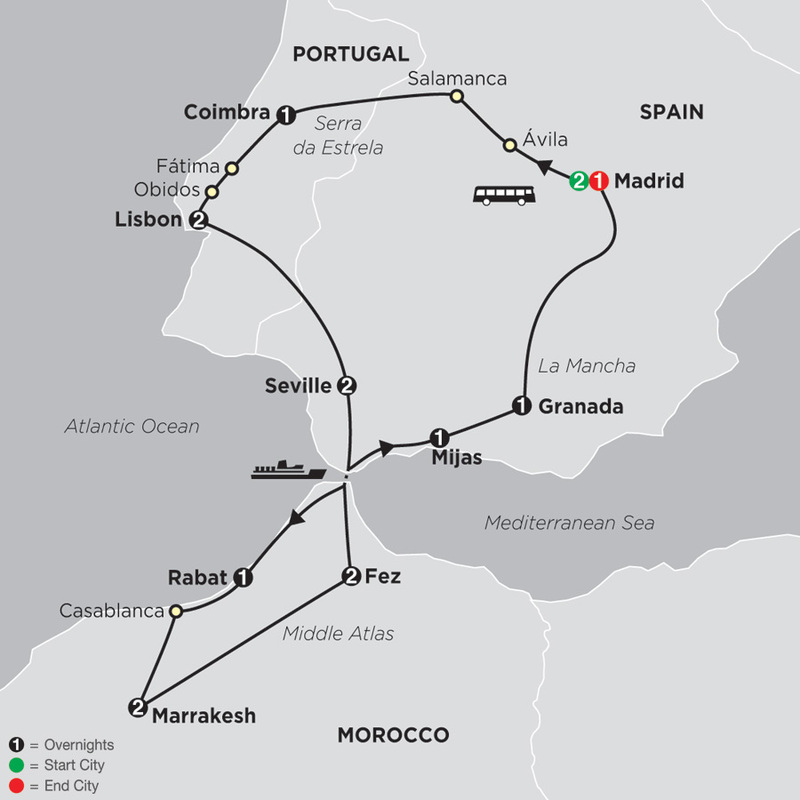 You'll overnight in Madrid, Seville, Granada, and the Costa del Sol in Spain; Coimbra and Lisbon in Portugal; and Rabat, Marrakesh, and Fez in Morocco. ...Read More. 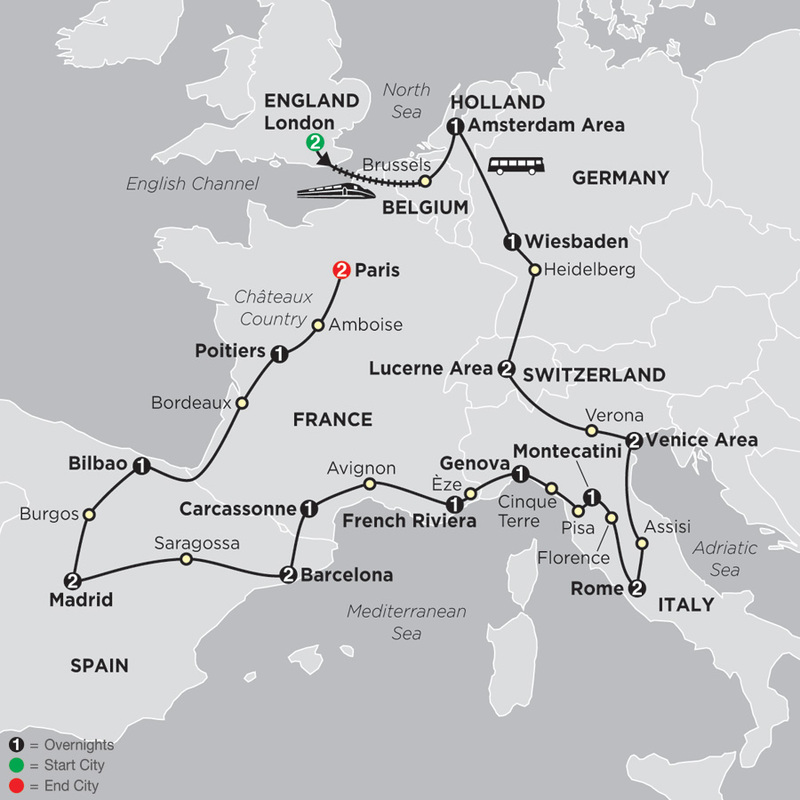 Your 16-day affordable tour through Spain and Portugal, with three nights in beautiful Barcelona will be a vacation to remember. 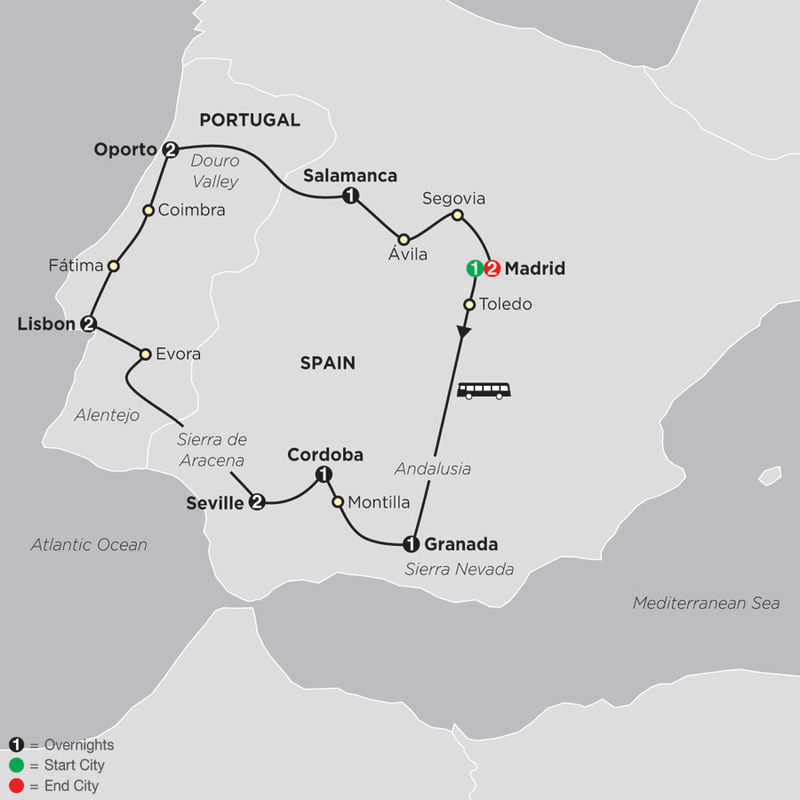 You’ll become immersed in the rich histories and distinct cultures of both Spain and Portugal as you travel through Madrid, Granada, Cordoba, Seville, ...Read More.